ASUNCIÓN, Jul 6 2012 (IPS) - Paraguyan rights groups are disappointed at being denied access to a delegation of the Organisation of American States (OAS) sent in this week to discover the facts behind the impeachment and removal of President Fernando Lugo on Jun. 22. The mission, headed by OAS secretary-general José Miguel Insulza, is expected to make public, on Jul. 29, its official report to the permanent council of the 35-member OAS that has its headquarters in Washington. The country “is peaceful” and the situation “is not serious, although it is delicate,” Insulza said during the delegation’s Jul. 1-3 visit to Paraguay. While the delegation held consultations with a range of social, economic and political actors, to learn the circumstances leading to Lugo’s ouster and his replacement by former vice-president Federico Franco, rights groups were kept away from the OAS team. Representatives of political parties, agricultural producers, business media, campesinos (peasants), indigenous people and the Catholic church were seen filing in and out of the hotel in downtown Asunción where the OAS delegation held consultations. Human rights organisations criticised the fact that the mission did not receive them despite their requests, and staged a demonstration at the airport when the OAS representatives left. “In our capacity as organisations recognised by the OAS itself, as well as by the United Nations, we asked to talk to the OAS observers, but they did not receive us and that is regrettable,” complained Elba Núñez, a member of the Paraguayan Human Rights Coordinating Committee (CODEHUPY). Núñez, coordinator of the Paraguayan chapter of the Latin-American and Caribbean Committee for the Defence of Women’s Rights (CLADEM), regretted “the biased view the OAS mission is taking away with them, as they have not heard all the voices, nor have they met with all sectors. “The human rights movement cannot be disregarded in this way in the case of a parliamentary coup d’état such as we have just experienced,” she told IPS. “We had high hopes of this visit, but now we have low expectations of their conclusions,” she said. Political analyst José Carlos Rodríguez said the main outcome of the OAS mission may be to mitigate the harshness of external sanctions against Paraguay. Neither has Asunción confirmed diplomatic recognition by Germany or Spain – as some international media had reported. Only Taiwan and the Vatican have actually recognised the new government officially. Paraguay has been suspended from the membership of Mercosur (the Southern Common Market), as also from the 12-nation regional Union of South American Nations (Unasur). Rodríguez said this is worrying as it means the country cannot defend its interests in any international forum. “At the moment, Paraguay is a pariah state,” he told IPS. In the view of former Liberal senator Gonzalo Quintana, now one of Franco’s advisors, the OAS visit was “a slap in the face” for ambassadors from countries of the Americas that have diplomatic representation in Paraguay. “Rather than being seen as under punishment, Paraguay is currently being admired because, although it is such a small country, it has stood up to two giants – Brazil and Argentina,” he told IPS. The Franco government went on a diplomatic offensive against its neighbours on Tuesday, accusing Venezuelan foreign minister Nicolás Maduro of interfering in the country’s internal affairs. María Liz García, the new defence minister, claimed that on Jun. 22 Maduro met with commanders of the Paraguayan armed forces and urged them to rally in defence of Lugo. As evidence, she displayed a video, with no soundtrack, showing Paraguayan military commanders, and shortly afterward Maduro, walking through the corridors at the seat of government, as Unasur foreign ministers flew into Asunción to seek a solution to the crisis. 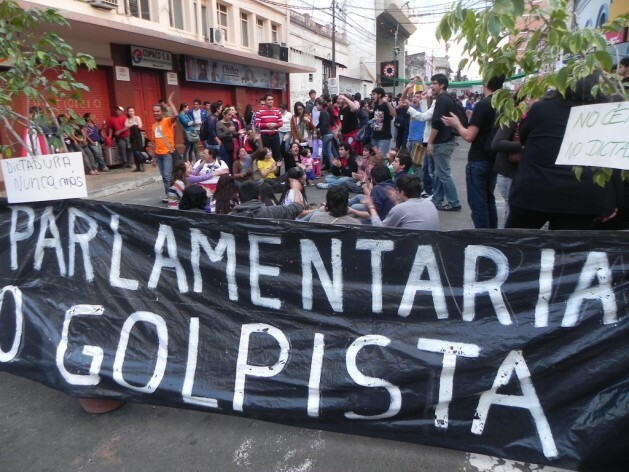 When the OAS observers arrived in Paraguay they were met by protesters claiming that Lugo was the victim of “a parliamentary coup,” and also by pro-Franco supporters objecting to Paraguay’s Mercosur and Unasur suspensions. Some 20,000 people demonstrated in support of Lugo on the streets of Asunción and in the provinces last week, mobilised by civil society organisations and leftwing political activists. Rodríguez estimates that pro-Lugo demonstrators represent 20 percent of the electorate but lack cohesion as a group. “They are progressive sectors that lack structure, and so they are like leaves that can be blown by the wind in any direction,” he said. On the other hand, the movement backing Franco lacks enthusiasm, he said. He cited a demonstration in support of the new government that was cancelled at a short notice with no explanation offered. Coverage of the crisis by the Paraguayan media has been harshly criticised by Lugo supporters. Rodríguez said privately-owned media clearly favoured the dismissal of Lugo, a former Catholic bishop. “The media supported the trial and are betting that Franco will stay in power until next year’s elections (due in April 2013). But there is actually no guarantee that he will last that long,” he said. In contrast, ‘Televisión Pública’, the state channel created by the Lugo government two years ago, has a different slant. Its main offices have become the focal point for the pro-Lugo movement called ‘Resistance to the Coup’. The channel’s “open microphone” programme has served as an outlet for expressing rejection of the new government ever since the president was deposed. Núñez said the private media “avoid portrayal of what is really happening in the country; they do not reflect all the views and voices. And this prevents people from getting a clear overall picture. “Private media are helping to propagate a state of fear in the population. That is why people are not holding mass demonstrations – because of fear,” she said.